Baking is the most time-consuming cooking method. Some baking recipes might even take several hours to finish, most especially muffins, cakes, biscuits, and cookies. It has to be perfect, ‘cause if not, then the end result could be very disappointing. However, baking doesn’t have to be a painstaking process with the help of the best baking pans. After all, a baking pan is an essential utensil in baking. With the variety of baking pans that are designed for specific needs, choosing the best one might be a bit daunting. To help you with that, we have gathered tips on how to choose the best baking pan and reviewed some of the products which we think are among the best out there. The size of your baking pan is a huge factor in how well it works on a specific baking task. It’s important to choose baking pans that are designed according to what recipe you will bake. For instance, a circular baking pan is ideal for baking a round cake, while muffins need baking pans that has several round sockets on it. Another important factor you should know is whether the baking pan will fit in your oven. If the baking pan doesn’t fit, then it is basically useless. If you’re baking more than one recipe or a huge quantity of one recipe, then you’ll need multiple baking pans of different types. Remember, baking is a long process; therefore, having only very few or lacking baking pans could make the baking process even more time-consuming. Some baking pans are made with sub-standard materials that can ruin your recipes. There are also baking pans made of materials that are ideal for a specific type of recipe. Needless to say, you can find different types of baking pans which we will discuss later. Some baking pans are designed to make your recipe look creative. Such examples are baking pans that have sockets to shape your cookies into stars, animals, hearts, and many more. Baking pans like these are ideal for children’s birthday parties, Valentine’s Day, Christmas celebrations, and other fancy events. Baking pans should be sturdy to withstand different temperatures and weights. It’s ideal that you choose baking pans that have that kind of quality so that you’ll be able to use them for a long period of time. This type of baking pan is the best in conducting heat. It is usually the go-to baking pan for bakers, although you have to be careful using them. It’s good at conducting heat but way too good sometimes. The glass can sometimes act as a magnifying glass due to the high temperature of the oven; therefore, your recipe might get burnt if you’re not careful. As much as possible, make sure to minimize the oven’s temperature. Another important reminder is not to put glass baking pans on a stove or broiler, as direct contact with heat can cause the glass to break. This baking pan is the most commonly used type by most bakers and bakers-to-be. They are much easier to clean and ideal for sweet treats such as muffins, cakes, cookies, and quick bread. However, it is important to choose the metal baking pan best suited for your oven. Most metal baking pans are either made of aluminum, anodized aluminum, stainless steel, tinned steel, copper, and cast. Each metal may react differently depending with on oven, so choose wisely. This type of baking pan is commonly used to make molds for cakes that are oddly shaped. Silicone is widely considered as the ultimate non-stick material, making it very convenient to use for muffins and cupcakes. They’re also very useful for desserts that need time in the chiller or freezer. Silicone can handle sudden temperature changes, unlike other baking pans. However, there is a slight downside to silicone baking plans. Unlike glass baking pans, silicone does not conduct heat very well. On the flip side, this means your recipes are not at risk of getting burnt as you can just let the oven do most of the work by raising its temperature. Similar to silicone, ceramic can withstand sudden temperature changes, which also makes it ideal for desserts that need time in the freezer after being in the oven for quite some time. However, be careful when handling ceramic baking pans as they break easily when dropped accidentally due to the brittleness of the material. The Natural Aluminum cake pan is constructed using pure aluminum. Therefore, it won’t rust and could last a lifetime. Due to aluminum’s excellent heat conductivity, your baked recipes will rise and bake evenly; moreover, its enhanced encapsulated steel rim prevents warping. This baking pan can be washed by hand only, not to mention it’s very easy to clean. 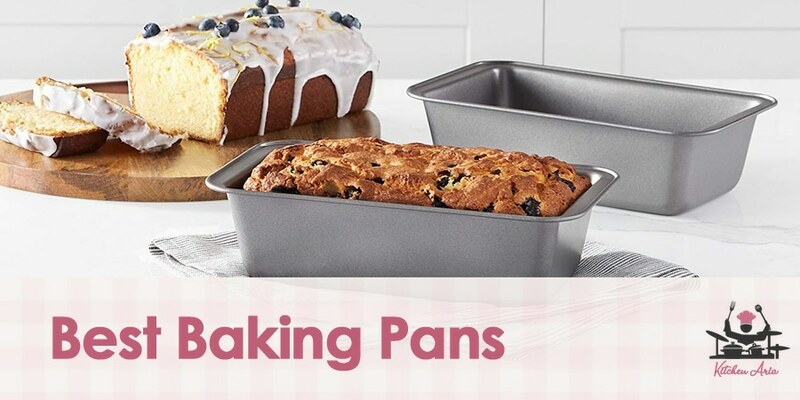 This baking pan is Swiss-engineered, made with a commercial-grade coating which makes it non-stick, and resistant to scratch, abrasions, stain, and corrosion. It ensures even baking thanks to its micro-textured patterns which minimize contact with the surface, allowing airflow underneath while adding structural rigidity. It has high side-walls which are ideal for multi-layered dishes and recipes. It also has squared roll edges that provide you with a secure grip for easy carrying and transferring to and from your oven. This baking pan, which is made in the US by USA Pan, is coated with Americoat, a silicone that is PFOA, PTFE, and BPA free. It is designed with a unique corrugated surface that allows air circulation underneath for evenly baked recipes and easy release. It is made of commercial-grade and heavy gauge aluminized steel which measures 8.5 x 4.75 x 2.75 inches. In addition, it is also made of a mixture of recycled and new steel. This baking pan by Emile Henry is ceramic, thereby enabling heat retention and keeps food hot even if it has already spent a long time on the dinner table. It is also resistant to sudden temperature changes – you can take it directly into your freezer from the oven without any problems. Its hard glaze is resistant from scratches, and it’s also ideal for desserts. Lastly, it’s easy to wash with soap and bare-hands, not to mention it comes with a 10-year guaranteed warranty against defects. This baking pan is coated with a non-stick coating for quick food release. It is also built with a tight seal for preventing messy leaks and spills. It should be hand washed with mild detergent. This is a 9-inch round cake pan built with heavy-gauged aluminum steel that enables even heat distribution. It is coated with a durable non-stick coating on both the interior and exterior. Also, it can prevent warping in high temperatures due to its thick rolled edges. This cake pan made by Nordic Ware is ideal for multi-layered cakes and sponge cakes. It is made of cast aluminum which enables quick and even heat distribution. It has a premium non-stick coating in the interior for easy release of the cake and easy cleanup. Moreover, it comes with a 16-cup capacity. As the name implies, this baking pan made by Farberware is ideal for baking cookies. Its heavy-duty construction prevents warping while allowing it to distribute heat evenly. It is coated with a non-stick coating inside and out for quick release and easy cleanup. It can be stored easily and can withstand temperatures up to 450 degrees Fahrenheit. This is another quality product by Emile Henry which is also made of ceramic, thereby enabling heat retention and keep food hot even if it has already spent a long time on the dinner table. It is also resistant to sudden temperature changes; you can take it directly into your freezer from the oven without any problems. Its hard glaze is resistant from scratches. It is also easy to wash with soap and bare-hands, and it has a 10-year warranty against defects. It’s basically the same as the Large Rectangular Baker – the only difference is that it’s designed for pies. This one’s a muffin pan by Nordic Ware that’s built from pure aluminum, thereby preventing rust and enabling long-lasting use. It comes with 12 sockets for your muffins: 3 rows and 4 sockets on each row. The muffins bake evenly thanks to the aluminum’s good heat conductivity. It even comes with reinforced encapsulated steel rim to avoid warping. This baking pan is ideal for bread, meat loaves, and many more. It is constructed using heavy-weight carbon-steel, making it durable and exerting superior heat distribution and conductivity. Its coating is non-stick which ensures easy and quick food release. It can also easily withstand an oven’s temperature of up to 500 degrees Fahrenheit. In addition, it is easy to wash by hand. We know for a fact that baking is a very delicate process. All it takes is one mishap, and all your cakes, bread, sweet treats, and other recipes will be ruined. Therefore, remember to use only the best baking pans to achieve perfect baking results. Moreover, make sure you’re equipped with other baking necessities such as baking sheets, oven mitts, and more.